Dangar Island is a small island in the Hawkesbury River, just north of Sydney. It has a population of about 250 people living there year round, and many more during the peak holiday periods. Dangar Island was home to the local Guringai Aborigines before Governor Arthur Phillip first visited the island, while exploring the lower river area in March 1788. He named it Mullet Island due to the abundance of fish in the Hawksbury River. The island was later purchased and renamed by Henry Carey Dangar, in 1864. There are no private cars on the island, so it is perfect for a quiet day trip away from the noise and smog of busy city living. The island has a general store, near the ferry wharf, that doubles as a cafe, and a bowling club is open on weekends for members and visitors. Bradleys Beach is a lovely spot to sit down and enjoy a packed picnic lunch. You can walk around the island if you feel energetic and want to see the islands highlights. 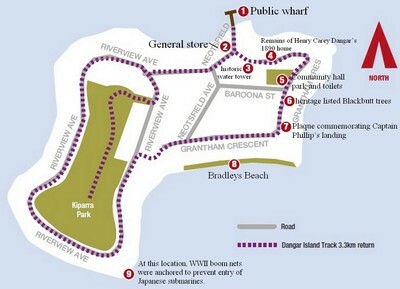 The loop walk is 3.3 km and passes by many places of interest like Grantham Crescent with its magnificent Blackbutt trees that are heritage listed, or visit the testimonials of Aboriginal occupation at Bradleys Beach and see the remnants of a shellfish midden. Middens are composed of the discarded shells of a variety of molluscs such as oysters, cockles and pippies, which were consumed by the Aboriginal people. The island is serviced regularly by the Dangar Island Ferry service that departs from Brooklyn and takes about ten minutes. The Brooklyn ferry is itself adjacent to thetrain station of Hawkesbury River. The ferry service is in operation 7 days a week. Cost: Entry to the island is free. Ferry fee varies.